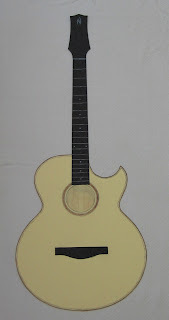 Richard’s guitar is now being lacquered and you can see it pictured above. 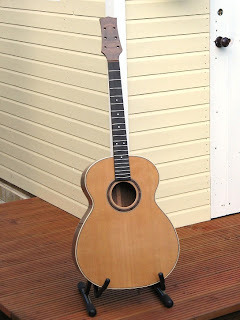 I am now offering two types of finishes, lacquer or French polish; again this allows the client to have exactly what they wish for, when they commission a guitar from me. Whilst Richard’s guitar is being lacquered, one of the other things that I’m working on is a baritone guitar commission for Ian. Below is my initial full-size drawing for Ian to consider, he has already been over to choose the wood; a bear-claw sitka spruce soundboard and some wonderful English walnut for the back and sides.....and so the circle continues! I always buy too much wood, so fortunately I have a good stock which allows most clients to choose whatever they wish. For back and sides, I currently have 3 varieties of walnut, 2 varieties of mahogany, 2 varieties of maple, and a good selection of Indian Rosewood in stock. Other woods are surprisingly easy to get if you are willing to pay the price. Last week I was offered 15 sets of Brazilian rosewood but the cost was prohibitively expensive; but the point is it’s out there! For soundboards, as well as the usual Spruces and Cedar I’ve got Douglas Fir and a stunning Californian Redwood soundboard that I can’t wait to use on something; watch this space!